$10 (Grades K-8); $15 (High School - Adult); T-shirt included with registration received by 4/6/18. 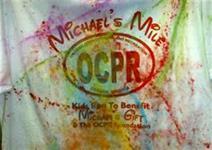 Michael’s Mile is a Fun Run to benefit the Michael’s Gift Youth Activities Scholarship Program and the OCPR Foundation. It will be held at Booster Park, behind the Orange County Airport on Route 20. This year’s event will feature color powder, that’s right, color powder! A white Michael’s Mile t-shirt (a perfect canvas for the color powder) is included with registrations received on or before 4/6/18. Want to bring the whole family? Great! Register up to 6 family members on one form (other side of this sheet). The registration fee is $15 for high school and older, $10 for K-8. All participants included on one form must be part of the same household. We will hold three runs, a half mile for grades K-2, a full mile for grades 3-5, and a full mile for anyone older. Parents/guardians may run with their kids in the primary and elementary runs, but must register as a participant and stay with their children throughout the run. This event is brought to you by the Orange County Office on Youth, Orange County Parks & Recreation, and the LGMS Leo Club.